Vol. 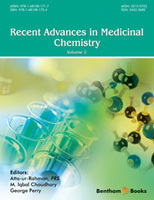 2 of the eBook series “Recent Advances in the Medicinal Chemistry” comprises seven chapters written by the leading experts in the field that provide state-of-the art information about the developments in important selected areas of medicinal chemistry. Polyphenols, such as carotenoids, glucosinolates, phytosterols, lignins, and flavonoids, are secondary metabolites of plants, abundantly found in fruits, vegetables, cereals, and beverages. Grapes, apple, pear, cherries, berries, dry legumes, tea, and cocoa, and products manufactured from them contain various classes of polyphenols in substantial quantities. Polyphenols have attracted tremendous scientific interest as antioxidants, which can provide protection against the on-set of cancers, cardiovascular diseases, diabetes, osteoporosis, and neurodegenerative disorders. Iriti and Vironi review the current state of knowledge about the biological effects of plant polyphenols relevant to human health in chapter 1. Among plant polyphenols, flavonoids have special significance because of their anti-oxidant, anti-inflammatory, anti-cancer and neuroprotective properties. Flavonoids are the most common polyphenols in the human diet. Diverse classes of flavonoids are found in natural sources such as parsley, onions, blueberries and other berries, tea, bananas, citrus fruits, Ginkgo biloba, red wine, sea-buckthorns, cocoa extracts, and dark chocolate. In chapter 2, Santos-Bulega et al. have reviewed the various classes of flavonoids, their role in plants, and their health benefits. They have also discussed the various techniques used for optimal extraction and analysis of flavonoids in various biological fluids, and dietary and medicinal plants. Klegeris et al. have contributed a comprehensive review in chapter 3 on cannabinoids, a class of diverse chemical compounds, which bind to cannabinoid receptors (CB1 and CB2) in the nervous system. Cannabinoids are produced endogenously and obtained from plant sources. The most important cannabinoid is the tetrahydrocannabinol (THC), which is the primary psychoactive compound of Cannabis. Cannabinoids exhibit various biological properties. This chapter is largely focused on neuroprotective properties of cannabinoids, such as inhibition of neuroinflammatory cascades contributing to Parkinson’s diseases and other neurodegenerative disorders. The mechanism of action of synthetic and natural cannabinoids as well as their adverse effects at molecular levels is presented. In chapter 4 Guo et al. present various aspects of medicinal chemistry related to epipolythiodioxopiperazines (ETPs) which are unique bridged disulfide or polysulfide dioxopiperazine six-membered heterocyclic compounds, found in many fungi. ETPs are known to possess a broad spectrum of biological activities, and have attracted major scientific interest in recent years. This review covers the diverse bacterial sources that produce ETPs, their synthesis, bioactivities and biosynthetic pathways. Oxadiazines are an important class of heterocyclic derivatives with diverse bioactivities. The Recent advances in the chemistry and biological activities of oxadiazine-based heterocyclic derivatives have been reviewed in chapter 5 by Cao & Ke. Sunitinib is an anticancer drug, which functions by inhibiting the cellular signalling by targeting multiple receptor tyrosine kinases (RTKs). The drug targets receptors for platelet-derived growth factor(PDGF-Rs) and vascular endothelial growth factor receptors (VEGFRs), which play a crucial role in tumour angiogenesis and tumour cell proliferation. In chapter 6 by Monzani et al. the recent literature on effects of sunitinib in the treatment of metastatic and radioiodine refractory thyroid cancers is reviewed. Mitochondria perform vital functions such as production of the energy for the cell, ATP (i.e., phosphorylation of ADP), through respiration, and to regulate cellular metabolism. In certain pathological conditions, the overproduction of reactive oxygen species (ROS), impairment in electron transport chain (ETC) and disturbance in mitochondrial quality control can occur. These mitochondrial dysfunctions can lead to a large number of diseases such as diabetes, hypertension, neurodegeneration, etc. In the final chapter by Cortes-Rojo and Rodriguez-Orozco an overview is provided of mitochondrial functions, consequences of mitochondrial damage, and the role of mitochondria in ROS generation. Efforts to develop new therapies, particularly mitochondria-targeted antioxidants, to manage the mitochondrial related disorders are also presented. We would like to express our gratitude to all the authors for their excellent contributions. We would also like to thank the entire team of Bentham Science Publishers, particularly Mr. Omer Shafi (Assistant Manager Publications), Mr. Shehzad Naqvi (Senior Manager Publications) and team leader Mr. Mahmood Alam (Director Publications) for their excellent efforts. We are confident that this volume will receive wide appreciation from students and researchers.